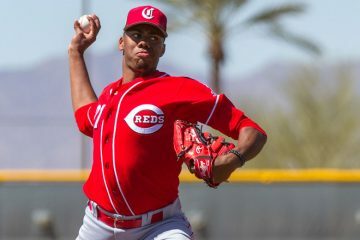 RedsMinorLeagues.com released the Cincinnati Reds Top 25 Prospect List in the final week of October. We try to get it done as early as possible to beat the other publications. But when doing that, it also means that trades will often mean prospects are coming and going on the list. 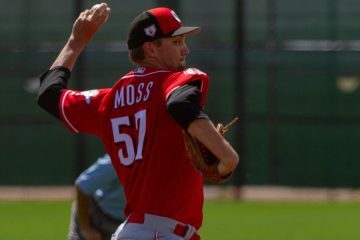 The Reds lost two of their top 25 prospects in the trade with the Los Angeles Dodgers. Josiah Gray, originally ranked #12, and Jeter Downs, originally ranked #9, both were moved in that deal. Earlier this month it was infielder Shed Long that was also moved. He was the #8 prospect in the organization at the time he was traded to the New York Yankees. Long was almost immediately traded to Seattle for those keeping tabs at home. The trade with the Dodgers led to outfielder Michael Beltre and reliever Ryan Hendrix joining the Top 25 list. It’s been just over a week since the Reds traded Shed Long in a deal for Sonny Gray and opened up a spot on the Top 25 list. 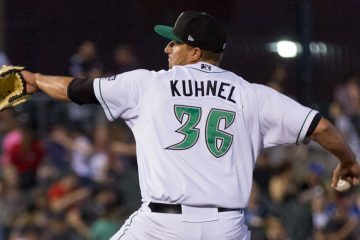 Today we’re going to fill that spot at #25 by adding right-handed reliever Joel Kuhnel to the list. I wrote up a full season review and scouting report on him for 2018 just three weeks ago. You can read the entire thing here if you’d like to (you should). Here’s the short of it all, though. He pitched in Daytona for the entirety of the 2018 season, picking up 17 saves as the closer. His ERA was 3.04 in 53.1 innings, where he allowed just 2 home runs. He also walked just 11 batters and had 56 strikeouts. Among relief prospects in the organization, he’s got the best pure velocity, touching triple digits. He also throws a quality slider. There’s a lot more in the link above, so go read it. But Joel Kuhnel’s certainly a guy who could move quickly in 2019, and it wouldn’t be shocking to see him in Cincinnati at some point in the second half. You can get full scouting reports, spray charts, season reviews, and video (on most of these players) at this link. with any look a new update will be required soon. No India, and not a few lower level top 25 prospects. Good selection. Pretty impressive. I followed him through your game recaps this past season only. Didn’t know much about him, though. He looked like a pretty big dude in your video, so I had to check. He is listed at 6’5″ and 260 pounds. He IS a big dude. Perfect for a late inning reliever that can throw some gas. Hope he can advance at a nice rate. He makes losing Tanner Rainey more palatable. If the premise is that the organizations top prospects, or at least those that are close to making a big league impact, are sent to the Arizona Fall League only one sent by Reds, Trammel, this fall were in the Top 25. (2 of Reds.com Top 30, adding Alfredo Rodriguez).In some ways I find this disappointing. Hope Josiah Gray doesn’t come back to haunt us. Hope we didn’t give up a John Smoltz or a Jeff Bagwell. That being said, I think except for the Sonny Gray trade that the Dodgers trade was about a quick infusion of talent to change the culture. Hope we have a great season and Puig and Wood become type 1 FA’s, rather than mid season trade for prospects unless it’s that lopsided of a trade. Always a risk, with any prospects. Josiah Gray a lotto ticket, but looks good. List still looks strong even with departures. Reds did a great job putting together a quality team while keeping all their big names. To date it’s been a thing of beauty.The most exciting off-season for Reds fans in many years. Given the failure rate amongst prospects i’m curious to see how this plan works out. I applaud them for their strategy. They are keeping what most consider their most likely impactful prospects and dealing from prospect strength in areas where the failure rate is much higher. Sure, you hear about non-top 100 guys becoming stars and surprise players, but in reality for every one of those guys, there are dozens, if not hundreds of similarly ranked players who never make it. You introduce a little more risk with young players in the low levels as those are the guys who become the top prospects once they prove it there, but even then, the odds are much greater they are average or below. The one I really worry about is Josiah Gray. I’m pretty cool with all the other guys traded away for present value big league production over hopeful projected future value. That pick in mid 30’s is as valuable as J Gray imo. But for sure biggest two loses then Downs. Downs is good, but never really took off like you would hope. Got to give something to get something though and Reds gave very little to get a lot of quality big leaguers. Central is gonna be super tough this year, but Reds should be able to compete to a certain extent. Rather have hope in that than the handful of prospects Reds dumped. Duke, what new red you expecting to have biggest impact on this team next year? That’s the hit or miss part. It’s the same place we took Stuart Fairchild, who is not as valuable as Gray. It’s an opportunity cost for sure giving up the pick, but by no means a guarantee that we take a similarly talented player there had we retained it. I don’t like giving up the pick whatsoever, but people saying its like we’re giving up a Trammell or Gray are jumping the gun a bit too. Feels like the Realmuto talks are cooling. I would love to have him, but I don’t think the Reds should overpay. Supposedly, the Reds have about $15M left they can spend. Would Craig Kimbrel be a good use for that money? His projections are about 4/64. How about 4/60? We’d be buying his age 31-34 seasons. Pretty solid last year, but he walked more batters and his HR rate inched up. Bill- no free agent pitcher worth a big contract will sign in cincy right now. They for sure had best offers to both Happ and kuechel. Come to terms w that. Makes the offseason reds are having even better. Wes, I appreciate where you are coming from. All things equal, one would assume FA pitchers prefer not to sign to play half their games in a notoriously hitter-friendly park. That said, Happ took a shorter contract with the Yankees for higher AAV than the Reds offered; he’s also familiar with their organization and their team is loaded! Further, we don’t know with certainty what Keuchel has been offered–only speculation; not facts. Third, Gray just voluntarily signed a multi-year extension with the Reds. He certainly didn’t have to come to Cincinnati and he’s been extremely good in the past. While I agree, Cincinnati is likely not a premier FA pitchers first choice, I haven’t seen any reported interest in Kimbrel … at all. So perhaps there is an opportunity. Foolish to summarily dismiss any opportunity to improve and adopt a defeatist approach. I think the Reds are having an awesome off-season … didn’t realize I was giving a different impression. Gray coming is Yuge in that sense! Gets some momentum rolling for Reds bringing in pitchers! based on need and statements released- Reds offered Kuechel more money than anyone. And most likely he passed on his best deal available to not play in cincy. Reds gave him plenty of time to come around and he didn’t so Reds moved on. When you aren’t getting the feed back you want- then you look to trade to acquire talent. The Dodgers deal was reported a week or two before it happened. Sonny Gray rumors for over a month. The deals go public to see if a better offer is made- when neither team can do better- they finalize the deals. I feel confident we are in the waiting phase of the Realmuto trade. It’s public that Reds will give India/Barnhart and change for him. So you need to come stronger than that or Miami will take that offer. Hopefully all this momentum will look good for reds for future free agents- they will have a ton of money to spend over next couple seasons and hopefully they don’t have to part with talent to acquire talent in future off seasons. How close were Alexis Diaz and Claudio Finol to to the top 25? Nearly every site has Trammal as our number 2 and Greene slipping down a notch. Im curious as to why you didnt. If his potential is truly that good then why isnt he our number 1? The prospect lists are inherently subjective, because people who make the lists will define the term “prospect” a little differently. Trammell, for example, is at least a year closer to the majors than Greene, so it depends on how you look at that. Siri has a high ceiling and a low floor. Senzel is ready now. Pitchers are looked at differently than hitters, and pitchers are looked at differently now than they were 5 years ago. How are we to rank Debby Santana? Some guys just explode out of almost nowhere to become very good major leaguers. Some top prospects flop. The same scout can be right on one guy and then be dead wrong on the guy playing right beside him. I look at them as general guides. One beauty of baseball is that it is the ultimate equal opportunity gig – if you can objectively play, then the subjective rankings are long forgotten. Given distance to majors, already present injury issues, the inherent injury risk with guy that throw that hard, and a less than linear path to success in 2018 I get having Greene lowered. His upside is still number one prospect front line cy young candidate pitcher, but the risk is very real. Well, what’s wrong with Barnharht? This guy is pretty good in our eyes, but, something we are missing? Barnharht is fine. Realmuto is elite. Difference the last two years has been about 1.9 war a year. This year’s draft could really put a finishing touch on the rebuild, providing starting or outfield impact for 2022. As it stands the top 25 needs someone like Siani, Siri or Hernandez to truly become an MLB starter. Once the current top 5 are assimilated into MLB, there really isn’t a clear impact prospect. This is the consequence of not drafting internationally for 2 years, as well as deciding a 5 year rebuild would have to be enough (as opposed to say an 8 year rebuild which should fill an mlb roster and the farm system). I put Sanmartin in my top 25. Throws strikes. Two quality pitches and a third that is not terrible. Is not afraid to throw inside. We will see with a full workload this year but he could be a sleeper. Sorry you are feeling so badly. Watch how you cook those eggs and turkey sausage and bacon and black beans. Eggs especially. Reds signed former Angles and Mets left-handed relief pitcher Ian Krol. Good depth piece. Krol and Boshers can battle to replace Kyle Crockett’s role. Gotta laugh that Reds fans think India or Hunter Greene have a bunch of value. One guy has never hit above rookie ball and the other had a grade 1 UCL sprain and we won’t know if the Platelet injection worked to revolve the issue and yes Doug, grade 1 UCL sprains can resolve themselves because they aren’t true “tears”. Even if it doesn’t work, Greene would probably only need the 6 month procedure and would be 100% ala the late Jared Fernandez by April 2020. That still kills his value. As the Angels learned, pitching a guy with a unresolved elbow sprain, doesn’t help. The Reds system is weak in general outside Senzel(and he has his own health issues). Nobody wants these guys that bad. Santillian may finally get up to good value if he has another good year. The system is high on raw talent, short on actual development. OK, cool. Thanks for setting us straight. I don’t know whether to point out that Hunter green is a fantastic prospect, or that jonathon India is a very good one (both taken top 5 in the most recent drafts). Or that UCL surgeries take longer than 6 months to heal, the fact that a lot of teams have been VERY interested in our prospects this winter, that his name was Jose Fernandez, or the other half dozen ridiculous hot tales you claimed. So I guess I’ll just say, “ummmmmmm ok?” You’ve gotta be intentionally trolling right? Sorry it was Jose, I got my J wrong. JF had a grade 1 sprain. Remember, the problem is whether the micro-tears heal, because the whole of the UCL is still intact unlike grade 2 sprains. That is why “Jose” came back so fast. It is a 6 month recovery and 6 month throwing regime. The usual is double for grade 2-3 tears. It also explains why Bailey destroyed any ability of coming back with his stuff when he shoudn’t have sniffed the field until the 2017 season. Platelets work 50/50. I think David Price had a grade 1 ucl issue in 2016-17 and platelets did heal it. Oh yeah, my takes kill your takes. I actually have some experience with ucl issues, you know having a grade 1 sprain myself and indeed, platelets healed it without surgery as well. Not everybody is that lucky. I agree that you can come back from TJ surgery in 6 months if it is not torn. I also need should point out that many players with sprains avoid surgery altogether. This part of Bob’s analysis is good. Now for the not so good part. India and Greene have been in the top 50 of all prospects in many “Expert” top 100 prospects and I believe in the top 75 in all of them. Senzel has always been in the top 10 and Trammel has always been in the top 20. Fangraphs rated Senzel and Trammel as 60 grade prospects and India, Greene, Santillan and Stephnson as 50 grade prospects. Sounds like the start of a pretty solid farm system to me. Of course Baseball America hasn’t gained the reputation in rating prospects that Bob has. Bob, I hate to tell you this: Hunter Greene had an actual tear in his UCL. I’ll just leave the rest of the stuff you said to be answered by everyone else below. Such confidence. What are your credentials again? Attn all MLB front office executives, this guy has been able to do something no one else has done. He have evaluated prospects with certainty. Find him on linkedin. ESPN’s 50 to 1 list is out. 3 reds in the top 16 spots. I think that is pretty good. I sure hope Bob let’s us know for sure though. I am sure 3 other teams have 2 players in the top 20. The Reds may be the only team to have 3. The Ray’s have 3 in the top 19. 1960. Leo Cardenas. Jim Maloney. Pete Rose. Tommy Harper. Cookie Rojas. Tony Perez. Or 1965. Tommy Helms. Johnny Bench. Lee May. Hal McRae. Some guys on this (2019) list may become HOF and/or multiple All-Star players. Mike, if you followed me on twitter you would have known how insanely sick I was. I’m doing much better now, but it was not good from about 11pm on Tuesday until about 10am on Wednesday. Recovering since then, and really feeling much better than I was – but it was not good. I’ve never been so sick in my entire life. You should add your twitter feed to the side area. Hope you are back to 100 percent. Oh, I know. I am feeling better today. Still nowhere near 100%, but I’m actually feeling like I’m not on the verge of death, truly. I’m able to actually work today. And concentrate. And walk.